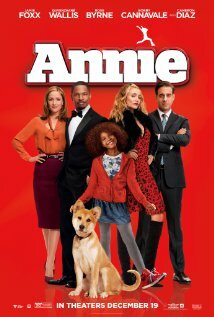 Quvenzhane Wallis, Jamie Foxx, Rose Byrne, Cameron Diaz, Bobby Cannavale. Tomorrow, tomorrow, tomorrow… For many, that and its tune (which can run irritatingly around in the imagination), is the lead in into the popular Broadway musical, Annie, from the 1970s, filmed by John Hoston in 1982 and for television in 1999. And here we are again. Interestingly, the trailer for this version does not emphasise Tomorrow but keeps repeating It’s a Hard Knock Life. While most of the patrons in the theatre queues were grandmothers, mothers and little daughters, there were some little boys there who were about to experience A Hard Knock Life for two hours as they watched this movie! This is definitely a film for female sensibilities. As indicated, the principal songs are there but there are also some new ones, generally very repetitive in the vein of all the songs, especially a montage of ‘It’s a New Life’, sung by several of the characters – over and over and over again. While still on complaints, the lyric for Tomorrow “love ya tomorrow” is especially grating, repeated and over emphasised. It grates on ya. Of course, there are things to enjoy in Annie. The scenario has been updated to an affluent, technological, 21st century. And, instead of Daddy Warbucks, there is now Will Stacks, an entrepreneur with phones and technology who decides that he should run for Mayor of New York City. He is played by Jamie Foxx. The Oscar-nominated young actress, Quvenzhanie Wallace, for Beasts of the Southern Wild, is more than the Moppet, Little Orphan Annie (she is determined not to be an orphan here because of a note from her disappearing parents and her stating that she is a foster child). This Annie is full of life, not for a moment lacking in self confidence. She is the life of the party at the orphanage, a chief antagonist for Miss Hannigan, the failed and would-be alcoholic actress who is in charge of the girls. Where can all this go? Annie sits every Friday night the Domani restaurant (Italian for tomorrow!) because their note says that this is where they will come. She sits in vain. What will become of her? In the meantime, Sticks who has few social graces, few touches of personality for a political campaign, is being fed information and lines by the devious Guy (Bobby Canavale) a go-getting political adviser. Sticks also has a personal assistant, Grace or from, Oxford, who tries to be a minder but, without realising it – and sometimes are not realising it - she is really in love with Stacks. She is played by Rose Byrne. The key to the future is in Annie’s running across the street, almost run over, but saved by Stacks, everything captured, of course, on a passer’s-by camera. What better for a campaign? With the idea that Stacks hold a press conference, with many photo opportunities with Annie, stacks invites her to stay with him. Annie has never seen such luxury – it is always forthcoming with her opinions at helping with the photo-opportunities.. The plot thickens with the intervention of the angry Miss Hannigan. In the past she has been played by Carol Burnett and Kathy Bates, but this time the usually glamorous Cameron Diaz opts for mugging. False parents are set up. Annie is deceived, Miss Hannigan repents. Grace is concerned. Stacks realises that life is not just business… And everyone hurries off in pursuit of Annie by car and helicopter culminating in an elaborate curtain-call song and dance routine on the streets of New York. Not a great show. But a show that a lot of people have enjoyed. 1. Popular Broadway musical? The film version, the television version? Popularity with audiences? 2. Musical theatre adapted for the screen, outside locations, the songs in situations and characters, staging of the songs and dances? 3. The popularity of Tomorrow, It’s a Hard Knock Life? The new songs? The musical score? 4. The updating to the 21st century? The business world and politics? An African American version? 5. The cast, its impact? 6. Annie, her age, a foster child rather than Little Orphan Annie, in the house, life with the girls, her leadership, the clashes with Miss Hannigan, girls talk, chatter? The natural parents, their return, going to the Domani restaurant, waiting every Friday, the sympathetic manager, giving the food? The bond with the dog? The chase, her being almost run over, the rescue, the change for her? 7. Will Stacks, Jamie Foxx, Guy as his adviser, Grace as his minder, their work? His campaign, lacking charm? His background, success, phones, technology? His motivations, his campaign – and the glimpses of his rival and his comments? Not good with people, his gaffes? 8. Guy, research, suggestions, the touch of the Machiavellian? 9. Grace, from Oxford, her concern, care, the deep love? 10. Stacks saving Annie, the photograph and film, the social media, an opportunity, Stacks being persuaded? The press conference? 11. The decision to take Annie, the apartment, the lavish style, the bed, the food, the views of the city? Yet Annie on the floor with the dog? Her comments about photo opportunities? Her getting to know Grace, Grace supporting her, going to the Domani? 12. Guy, his going to Miss Hannigan, the plan, finding the substitute parents, their being trained, arrival, Annie at first believing, in the car, realising they were not her parents? 13. Annie, the effect, the couple of the car, bad-mouthing Stacks, Annie upset and disillusioned? 14. The character of Miss Hannigan, memories of her past life, the would-be actress, drinking, and harshness with the children? The changing, change of heart and conscience? 15. The role of the media, television, newspapers? 16. The chase, the helicopter, saving Annie, reunited with Stacks? Guy and his comeuppance? Miss Hannigan cheeriness? Annie persuading Grace that she loved Stacks? 17. The finale, singing and dancing in the street, cheerful ending for a cheerful film?